For those that aren’t linguists (cunning or not), biscotti (Italian) and biscuit (good ole English) are both derived from from the Latin word biscoctum, which means twice cooked. 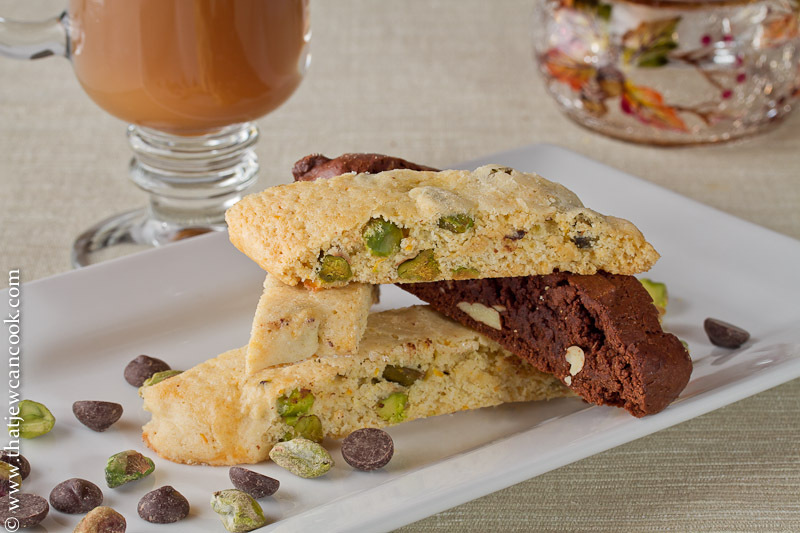 I love biscotti, and the harder and crunchier the better. So why not go for the trifecta and bake it a third time? After the second bake and 20 minutes of ‘resting’ on the wire rack, we put them back, rack and all, into the still warm oven. Hypercrunch ensued! I know this twice or thrice baking sounds like a lot of work and gymnastics to pull off, but it really wasn’t too bad. Nik and I shouldn’t have procrastinated all those years before we made these puppies. Since Valentine’s Day falls on a Monday and we are commuting challenged, we decided to make these sweet treats over the weekend and do something simpler for V-day. Besides, we have plenty of date nights without Hallmark’s invented way to make some extra loot. Sorry, no heart shaped or red velvet anything, but we did make two separate recipes because we were so damn indecisive. Double chocolate or pistachio? Why not both? If you are only going to make one recipe, Nik and I agree: make the pistachio ones. They still have chocolate chips, but also a healthy amount of lemon and orange zest to give ’em a nice unexpected zing and zip (three z’s for the win! Pay me.) Nicole thought the candied ginger in the chocolate biscotti was a bit overpowering, but I thought it was pretty good, just unexpected. Sunday morning breakfast at the Jew household. We started the day off pretty healthy. Fold in the nuts and chips by hand, and chill (the dough) for an hour. Lay the cookies on their sides and bake at 300 for another 15 minutes. Remove racks, let cool, and start your crunching! My kingdom for a glass of milk! Whisk flour, cocoa powder, baking powder and salt. In a bowl, not on the counter. Enjoy, maybe next time we’ll go for quadcotti. Octocotti anyone? 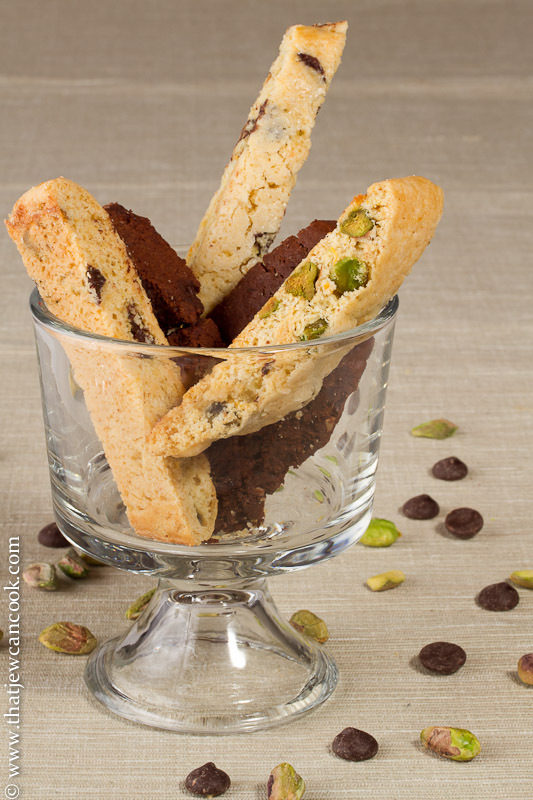 I love biscotti, too – and these look divine! I love the idea of the third baking if you like the crunch. I like them a little less crunchy, so twice is good enough for me. Both recipes look divine and the pics are gorgeous. Just back from DSLR boot camp and am currently on overload. Can’t photograph a thing from what I have learned until I go over my notes and pics and practice! Thanks Val! Let me know if you need a hand in the DSLR usage or want some help with your studies — always happy to lend a hand! 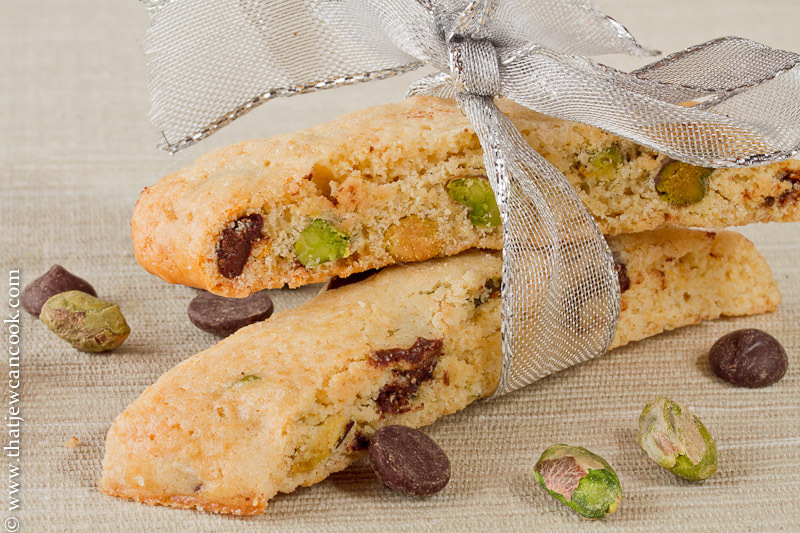 Love biscotti. I have only made it once. I trust that baking three times was the way to go, if you like extra crunchy. Certainly would have been fine with me because it would have went been dipped right into my coffee cup. My husband and I also do not indulge too much into V-day. We always enjoy a realy nice meal, and enjoy each other’s company.